Think you would make a good detective? Join Sherlock Holmes and Watson to find the missing jewels in this riveting online slot: Holmes and the Stolen Stones from Yggdrasil. This slot is loaded with features, free spins and progressive jackpots. So, grab your magnifying glass and let’s take a closer look at what Holmes and the Stolen Stones has to offer. 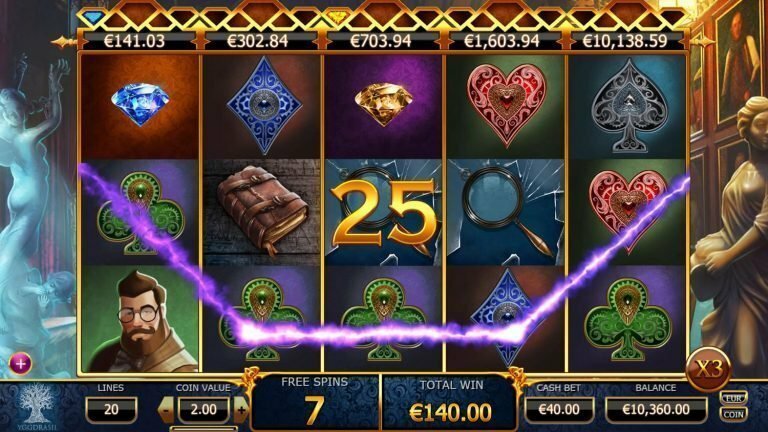 Holmes and the Stolen Stones is a 5-reel, 3-row, 20 paylines slot. The theme of the game is based on the legendary detective Sherlock Holmes. The reels are filled with ornate symbols, plus Mr Holmes and his trusty sidekick Watson. The backdrop of the game appears to be some sort of old city or town. At the top of the reels, you will notice 5 different values that represent the various progressive jackpots that can be won. To keep you on the edge of your seat, the apt music sets the tone for a thrilling slots adventure. Getting the reels rolling is as simple as setting the coin value and hitting play. There is no confirmation of paylines or coin levels. Within the main game, besides trying to activate the bonus game and free spins, which is described in more detail below, your goal is to collect the various different coloured diamond shards. Each diamond is made up of 5 shards. Not only does 5 shards of the same colour trigger the free spins, but it brings you closer to winning a jackpot. There are 8 regular symbols in Holmes and the Stolen Stones. The top paying regular symbols are Sherlock, Watson, a leather notebook and a magnifying glass. If you land 5 Sherlock symbols on a payline, it has a very decent 4000-coin payout. At the lower end of the symbols are playing card suits being, spades, hearts, diamonds and clubs. In terms of special symbols that will bring you towards the BIG wins, is the bonus symbol, that looks like a golden keyhole with ‘Free Spin’ written across, which as you can assume, will initiate the free spins. Finally, in terms of symbols, there are the diamond shards that come in 5 different colours that you need to collect to win progressive jackpots. The Bonus round on Holmes and the Stolen Stones slot is triggered when you get 3 or more bonus symbols. If you land 4 of them, you will score an instant 1,000-coin win too and enter the Warehouse Bonus Game. If luck really is on your side and you get 5 bonus game symbols, then you will bank an extra 10,000 coins instantly and enter the Warehouse Bonus Game. As you can tell, this slot has some serious payouts. But wait, there is more because once the Warehouse Bonus Game starts, you can rack up even more winds. In the bonus game, you select boxes and reveal the prize inside or until you uncover a smoke bomb, which ends the bonus game. The boxes contain coin wins ranging from 20 coins up to 1,000 coins. You may even discover diamond shards. No modern slot is complete without an awesome Free Spins round and Holmes and the Stolen Stones is no exception. The Free Spins are triggered by getting 3 or more free spins symbols or once you collect 5 diamond shards of the same colour. You will be awarded 10 Free Spins. Plus, all line wins pay a 3X multiplier. You also have the possibility of triggering even more jackpot free spins during the round. One of the main attractions of Holmes and the Stolen Stones slot are the various progressive jackpots. As mentioned earlier, each of these is represented above the reels. Collecting the coloured diamonds brings you closer to winning a jackpot. You will need 5 full diamonds to win the respective jackpot for that colour. If you triggered a free spins round, as described above, with 5 diamond shards of the same colour, then when the free spins round begins, you start with 1 full diamond already, which means you only need 4 more diamonds to win the respective progressive jackpot. There is no limit to the size that the jackpots can grow, so you could be in for some crazy winnings. Holmes and the Stolen Stones has 20 fixed lines; there is no option to adjust this or the bet amount per line. The theoretical return to player is 96.8%, which is a pretty solid RTP. Holmes and the Stolen Stones has a medium volatility, which should provide enough small to medium wins to keep your bankroll going till the bonus or free spins, or hopefully, till you land a big jackpot. Yggdrasil has done it once again. They have delivered a top-quality slot with all the key features one expects from a modern slot. While this slot doesn’t have loads of features like other slots, the progressive jackpots are a nice touch and make playing this slot even more exciting. The graphics, animations and sound effects are excellent. Gameplay is smooth and within a few spins, it’s really easy to grasp the concepts and immerse yourself in the game. Take Holmes and the Stolen Stones for a spin right now at Rizk!